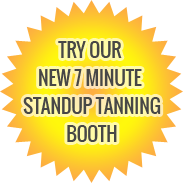 You can count on our certified staff to help you achieve the best possible tan at Sun Touch Tanning. We have state-of-the-art equipment and top notch tanning lotions that will give you the ultimate tan. We offer both Sunsource tanning beds and suncapsule tanning booths for your choice of 3 different levels of tanning. Visit our salon and become a part of our family. We offer 3 levels of tanning! our monthly specials and for questions!